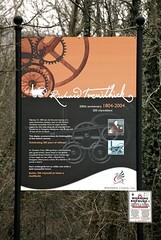 Posted by Stuart Herbert on April 23rd, 2010 in A470 Trunk Road, Coal, Edwardsville, Glamorganshire Canal, Historical, Photos, Quakers Yard and Merthyr Joint Railway, Shoot. 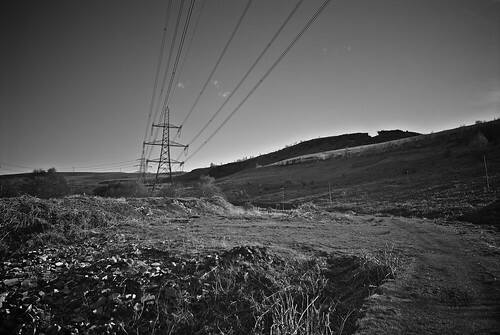 Drive north along the A470 from Abercynon, and your view to the left is dominated by the Giant’s Bite, a gap in the skyline quarried from the ridge top. The Giant’s Bite is a strange sight indeed, clearly visible against the sky. Up close, the quarrying that created this unique feature of the landscape is clear to see. 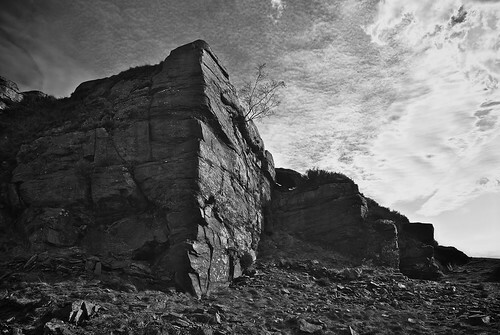 Its position on the ridge top makes it easy to take dramatic photos of the quarry face against the sky. 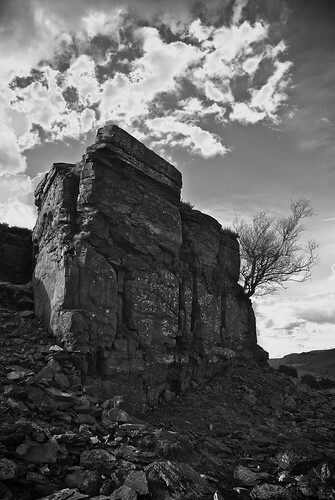 This single tree growing out of the old quarry face makes a great focal point for photography. Further down the slopes likes the eastern entrance to the old Cefn Glas railway tunnel that runs under the mountain. The views from the Giant’s Bite, more formally known as Cefn Glas, are best to the east, where you have Edwardsville and Quakers Yard. 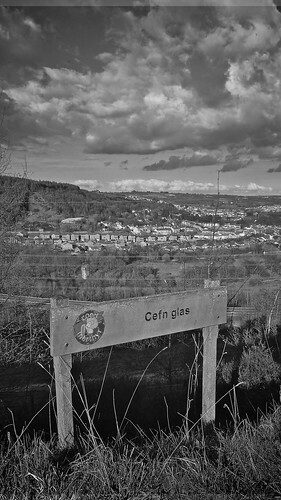 We’d gone out for the afternoon for a walk on Cefn Glas. There’s a choice of routes to it; you can cycle along the Taff Trail over the Pontygwaith bridge and then head south instead of north, or you can drive to it through either Quakers Yard or Abercynon. We decided to drive, and parked up right at the foot of the ridge line itself. The walk up from the road is easy enough. 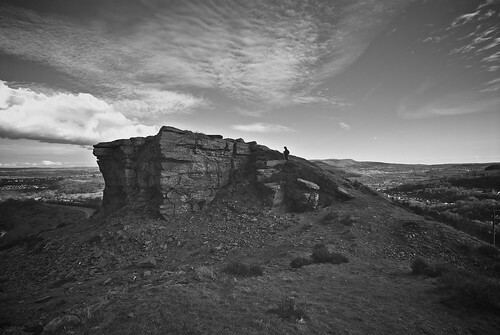 The ridge itself is maybe half a mile long, running north to south, making for a nice afternoon of wandering along between the Cynon Valley to the west and the Taff Valley to the east. The Giant’s Bite itself is much rockier, and takes a bit of care to clamber around; I can imagine it being a fun place to bring the kids for an afternoon. Although bright and sunny on the day, there were just enough clouds in the sky to make it extremely difficult to turn the colour shots into anything usable at all without HDR. Rather than resort to HDR, I decided to turn them into a black and white set instead. I can’t decide whether or not I’m happy with the results, but they are what they are. I’ve really struggled to find anything at all about the Giant’s Bite on the Internet, but there’s plenty to be found regarding the railway tunnel that runs underneath. Taff Vale Extension Railway: Cefn Glas Tunnel on the Coflein website. 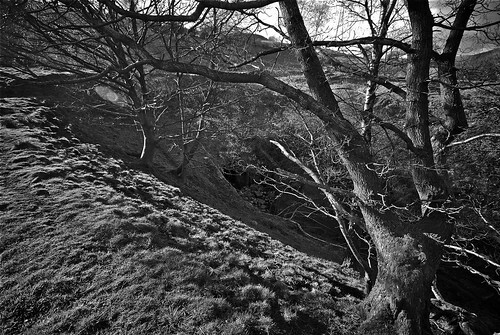 The Quakers Yard Tunnel on the Black Mountains website. (Part 2 is also well worth a look). The Cefn Glas Tunnel on Rat Sandwich. The Cefn Glas Tunnel on the Cardiff Rail website. Photos of the Cefn Glas Tunnel on Flickr. 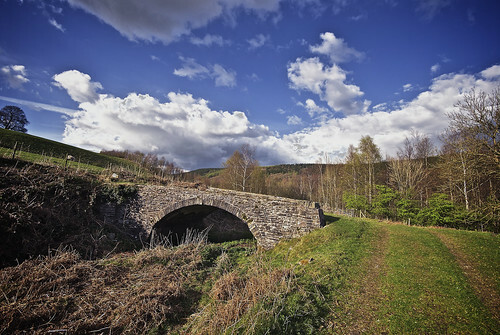 Posted by Stuart Herbert on April 19th, 2010 in Edwardsville, Glamorganshire Canal, Historical, Photos, Quakers Yard and Merthyr Joint Railway, Shoot. Just a few hundred yards from this bridge is the eastern end of the Cefn Glas tunnel, which ran under the mountain from Penrhiwceiber to Quaker’s Yard via one of the lost viaducts over the River Taff. Behind is the Giant’s Bite, an odd stone quarry dominating the skyline to the west. Across the river runs the Penydaren Tramway, the route of the first steam railway journey in the world. The tramroad runs near Pontygwaith and its historic bridge over the Taff.